Foreign domestic helpers who flock to Hong Kong in search of better wages are often lonely and suffer from the intense pressure placed on their marriage, China Daily has discovered. By the end of last September, almost 270,000 people were working as cooks and cleaners throughout the city, official immigration figures showed. The vast majority of them are from the Philippines and Indonesia, while about 10,000 are from Thailand and other Southeast Asian countries. Despite their numbers, many are isolated by the language barrier and do not spend enough quality time with their families, Christian charity worker Pang Wai Lun said. "All they know is work, work, work, sometimes from 6 am until midnight," said Pang, a pastor with the Universal Church of the Kingdom of God help center in the island's Sheung Wan area. "They are all homesick and do not spend enough time with their family; face to face, I mean, not just long-distance calls," he said. As about 90 percent of the population in the Philippines is Christian (a number of Indonesians also practice the faith), church services have become the No 1 place for domestic helpers - mostly women - to meet up. Pang, who is from Hong Kong, started his church on the 14th floor of the Tung Hip Commercial Building in 2002 and it has been growing in popularity ever since, with services in English today attracting up to 600 Filipino worshipers, he said. In addition to preaching, the pastor also offers marriage guidance to help couples cope with the troubles that spring from long-distance relationships. After every service, women line up to talk to him in private. "They have no family in Hong Kong and they often live in their employers' homes, so they need someone to talk to," said Pang. "It is the same for anyone who is separated from their family for long periods." Compared to the towns and villages the foreign domestic helpers usually come from, Hong Kong is a mind-blowing metropolis where these women learn new ideas about work, life and money. Yet, while they grow, their husbands back home stay the same, which can often drive a wedge between couples, said the pastor. "Common problems I hear are temptation (to stray from the marriage) and breakdowns in communication," said Pang. "Of course, over time, couples also find themselves drifting apart." 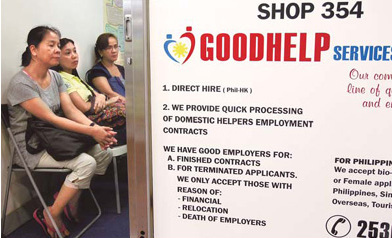 A large number of overseas domestic helpers, particularly from the Philippines, are well-educated college graduates who could easily find office jobs and even managerial positions in their home country. However, pay is usually far lower than in Hong Kong, which is why many make the move. As this often results in the woman becoming the main breadwinner, workers from countryside areas told China Daily that this tipping of the traditional family balance can "unsettle" husbands. "My husband doesn't work, so the family is entirely dependent on me," said Estrela, a domestic helper from Laguna, a southern province of the Philippines, who did not want to use her full name for fear of upsetting her employers. "It means I shoulder a lot of the responsibility and, when we talk (on the phone), it's always about money." Estrela, who is in her 50s, has worked in Hong Kong for 16 years, 12 of them with her current employer. She gets 21 days of vacation a year, which is the only time she gets to spend with her husband, a jobless tailor, and her son, an export company officer. She said she makes three phone calls home a week, each lasting less than 30 minutes. After so many years away, she began to send less of her salary to her family and instead, save up so she could return for good. However, her plan has constantly been beset by health problems. Not only has Estrela struggled with kidney problems but her husband also had a heart attack, once even traveling to Hong Kong for treatment. Coupled with the long-term separation, the financial strain stretched the couple's marriage to the breaking point. "There have been many ups and downs in my marriage," she said, explaining that most Filipino domestic helpers she knows have suffered marital problems after their first or second year in Hong Kong. As divorce is illegal in the Philippines, Estrela said men simply find new women while their wives are away. "I tell the women not to be too pushy with their husbands," said pastor Pang. "Marriage is not a competition about who is right and who is wrong. The key is to make sure their husbands grow with them." Estrela admitted she quickly realized she was pushing her husband away. "I called him on the phone and told him I didn't want to lose him," she said. "I prayed and told myself to be patient. Later, he called back and said he didn't want to lose me either." 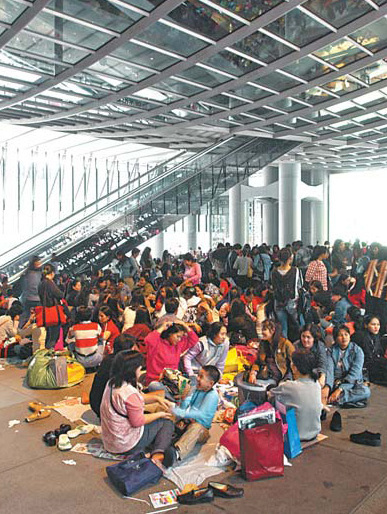 Every Sunday, while hundreds of domestic helpers gather in Central district's Statue Square to eat and chat, clusters of others fight through the hustle and bustle of the pedestrian overpass not far away carrying huge boxes. One of them is Estrela. "I started sending clothes back last year, which my husband sells from a store we have opened," she said. "We've put up a poster advertising 'Hong Kong originals'. The shop's been doing really good business and it brings in really good money." The shop was the result of an agreement she made with her husband to supplement the family's monthly income. "It's helped me to save money faster," said Estrela, who estimates she will have HK$100,000 ($13,000) in the bank within the next three years. "My husband also wants me to come back. We can't wait any longer. "I also want the store to grow. I find I'm becoming very business-minded," she added with a smile. Eden, another Filipino domestic worker (she did not want her full name used), is also trying to save money to return to her husband, teenage son and 2-year-old daughter. 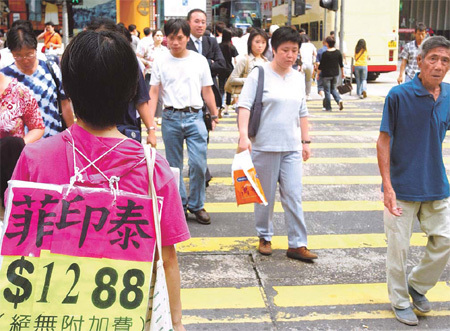 With a monthly salary of HK$3,500, the 37-year-old believes it will only take another four years to raise the cash she needs. "We decided I should come to Hong Kong (eight years ago) for the sake of our family's future," said Eden, whose husband runs a village farm in southern Philippines. "We couldn't depend on farming; it is too volatile." Filipinos began heading for Hong Kong in the 1970s as part of their country's drive to export cheap labor to alleviate rising unemployment and soaring debts. The move came at a time when economic conditions in Hong Kong were flourishing thanks to its booming manufacturing and service sectors. With more women being encouraged to join the workforce to meet demand, the need for domestic workers grew. Families quickly began to hire workers from the Philippines because of their ability to speak English (which is taught in most of the nation's schools and colleges), as well as the fact that many of those arriving were trained nurses and teachers. Pang at the Universal Church of the Kingdom of God said although workers like Estrela and Eden often slip into the crowd, their devotion to their families sets them apart. "The city is not an easy place to live but they are doing great," he added.